Uniondale, NY, January 9, 2019 — Gabriella E. Botticelli has joined the law firm of Forchelli Deegan Terrana LLP as an associate in the Tax Certiorari Practice Group, it was announced by Jeffrey D. Forchelli, Managing Partner of the Uniondale-based firm. Her co-authored article, “Real Estate Tax Exemptions for Solar Energy Systems,” was published in the New York Real Estate Journal. 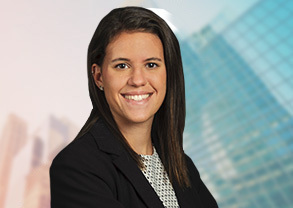 During 2017, Ms. Botticelli was a law clerk at the firm, where she gained exposure to transactional and litigation matters by working with various departments. Prior to her time at the firm, she held the following positions: Policy Intern at the Maryland Coalition Against Sexual Assault; Volunteer of the Court, Family Court Self-Help Center; Intern to The Honorable Craig Iscoe, Superior Court of the District of Columbia; and Intern to The Honorable Hector LaSalle, Supreme Court of the State of New York, Appellate Division. She is a graduate of the George Washington University School of Law.